For photographers who frequently shoot outdoors, weather sealing is a must. It protects your expensive camera gear, takes away much of the worry, and allows you to keep shooting when others have to pack it in. 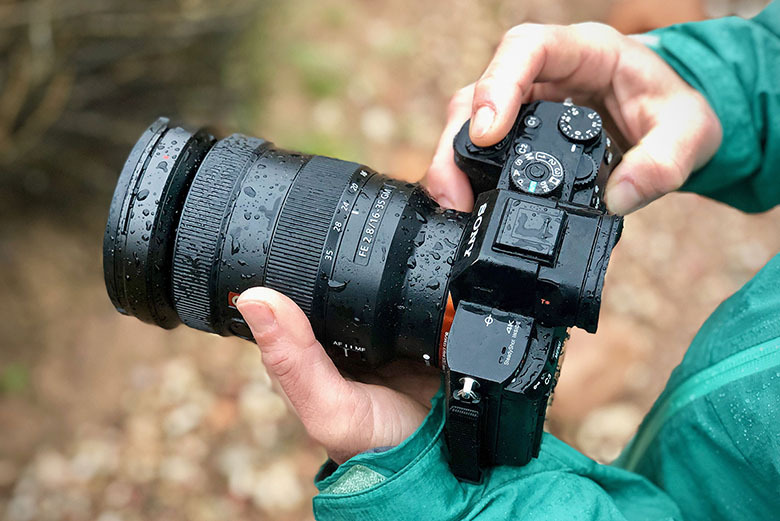 Below is a complete list of weather-sealed mirrorless camera models on the market in 2019. This feature is found on mid-range and high-end models, so beginners will need to spend up for the technology. Weather sealing does vary by manufacturer, and we detail that and other buying considerations below the picks. If you’re still choosing between types of cameras, we’ve also published a list of weather-sealed DSLRs. Similar to digital SLRs, this list of weather-sealed mirrorless cameras is comprised of mid-range (enthusiast) and professional models. Currently, the cheapest weather-sealed mirrorless options are the Panasonic G85 and Sony a6300 at $700 and $850 respectively, plus the cost of weather-sealed lenses if you decide to go that route. A handful of attractive Micro Four Thirds cameras offer weather sealing, including the popular Olympus OM-D EM-1 Mark II and video-centric Panasonic Lumix GH5. Fujifilm’s high-end offerings like the X-T2 and X-H1 offer weather sealing, and they have a number of great lenses with weather sealing as well. Sony is slightly less promotional than other brands about the toughness of its mirrorless cameras, but many outdoor photographers we know use the crop sensor Sony a6500 and full-frame Sony a7R III. Both are listed as being dust- and moisture-resistant. Nikon was unique in creating the only “waterproof” mirrorless camera (if there is such a thing) in the 1 AW1. Other models offer resistance to moisture and dust but prolonged exposure or submersion certainly is not recommended. If you read user reviews closely even of the 1 AW1 or other “waterproof” cameras, anything can happen, and damage from the elements always is a possibility. The 1 AW1 has been discontinued by Nikon which is why we left it off of this list, but if you do some searching, you’ll likely able to find one used. All things considered, we are strongly in favor of weather sealing and proofing as it takes the headache away from shooting outside with expensive gear. Many professional photographers depend on it heavily. What Exactly is Weather Sealing? Unfortunately, there isn’t a universal method that camera manufacturers use to define weather sealing or how it protects your camera. Sleeping bags, for example, have a handy EN Temperature Rating system that tells you about how warm a bag will keep you at night. The waterproofness of rain jackets is tested by determining the amount of water in a 1-inch-diameter vertical tube that the material can withstand without leaking. With cameras, however, it’s more like the Wild West. In general, the process of weather sealing involves covering and sealing the joints and button areas on the camera body with rubber to reduce exposure to moisture and dust. This makes the camera resistant to the elements and we’ve seen people shoot in some pretty tough conditions and come away unscathed, but they certainly aren’t “waterproof” (even “waterproof” cameras constantly receive complaints of leakage). What does this mean for photographers in the field? Weather-sealed cameras are resistant to splashes of water (you’ll see the term “splashproof” used instead of “waterproof”) and normal amounts of dust but not necessarily prolonged exposure. If you drop your weather-sealed mirrorless camera in a tub full of water, you will be severely disappointed with the results (and probably will need a new camera). Outdoor photographers should feel confident using it in a variety of conditions, but good care is still required, as is proper cleaning and storage. To highlight what you can expect from weather sealing, we took a look at the specific language on the web pages and press releases of various camera manufacturers. As you can see, there are major differences. And although the excerpts below are not definitive, they are helpful in trying to gauge what to expect. Sony doesn’t play up weather resistance as much as other manufacturers, but it is mentioned in the “Reliability” tab of both the a6500 and a7R III as well as periodically with the a7R II and a6300 (Sony is clear to point out that these cameras are “not waterproof or splashproof”). Major retailers and camera review sites confirm that the magnesium alloy bodies are indeed weather sealed. After choosing your camera, don’t forget to consider weather-sealed lenses (the lens is just as exposed to the elements as the camera, if not more so). Similar to cameras, the manufactures are not particularly forthcoming about this process. It’s slightly less complicated to weather seal a lens with fewer buttons and points of entry, but generally a separate sealing is added to the exterior and joints of the lens to keep moisture and dust out. Of course, the seal between the camera and lens is of particular importance as that zone offers direct access to all of the critical internal components, including the image sensor. Some “pro” lenses with a maximum aperture of f/2.8 or faster are weather sealed, but it’s really a case-by-case basis. Olympus advertises nine M.Zuiko weather-sealed lenses to choose from covering virtually all focal lengths, including our favorite: the Olympus 12-40mm f/2.8 Pro. Fujifilm has fourteen options (seven primes and seven zooms) and are kind enough to label them with “WR” for weather resistance. A handful of Sony lenses are listed as being dust- and moisture-resistant, mostly of the FE (full frame) variety. Again, weather-sealed lenses are not mandatory but you should take them under strong consideration.